Oftentimes visitors enjoying Germany focus on the big cities, neglecting the beautiful country’s historical towns. Here is our list of the Top 12 Towns to visit while in Germany. This tiny, picturesque town tucked in the Rhine Valley is known for its timber-framed houses and its beautiful churches. 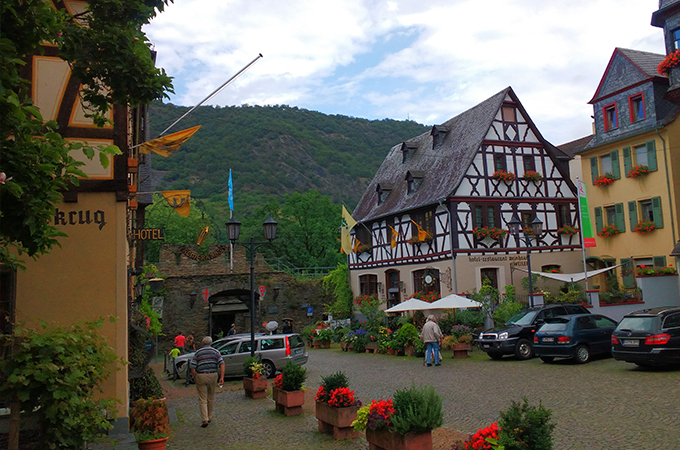 Also located in the Rhine Valley, this town is a UNESCO World Heritage Site, known for its winegrowing and agriculture. Located on the Middle Rhine, Oberwesel is filled with tons of historical buildings, including the Schonburg Castle which was built sometime around 1100. As the third largest city in Rhineland, Koblenz originates from the Latin word meaning ‘the merging of rivers’. Well known for its military history with more attractions than the smaller towns in Rhineland, Koblenz pleases all. Famous for being the birthplace of the movable-type printing press, Mainz is obsessed with books. Near the University of Mainz, the Gutenberg Museum looks into the history of printed masterpieces while across the street you can try out such technology yourself at the Druckladen. Most famously home to the Cologne Cathedral (Koelner Dom), and a series of twelve romanesque churches, Cologne is a living textbook. Also where Schildergasse is, dubbed the busiest shopping street in Europe with 13,000 people passing through every hour. Tucked in southwest Germany on the Neckar River, Heidelberg is known for its sweeping scenery and its prestigious 14th-century university. As part of the Romantic Road, it is no surprise that Dinkelsbuehl is a gorgeous, historical, Bavarian town. Known for its beauty and small town charm, Dinkelsbuehl is a nice escape from the chaos that is Munich. With a rich and haunting history, Nuremberg is the second largest city in Bavaria. After WWII the city was nothing but rubble, so over the last seventy years has rebuilt itself, returning to its former glory. Placed along the Main River and known for its wine, art and architecture, Wuerzburg was also mostly demolished during WWII leaving much of the buildings now new and the city still growing. Often considered the quintessential German fairy-tale town, Rothenburg attracts over two million tourists every year. Home to over 25 Gothic churches, Martin Luther attended the city’s school, Erfurt University and was ordained as a preist in Erfurt. The city of flowers and horticulture is in the heart of Germany with many significant Jewish sites, such as Europe’s oldest standing synagogue. Interested in visiting these towns? Check out our German Untours here!